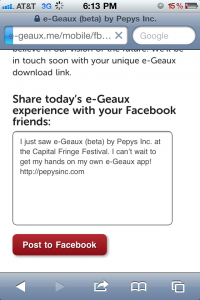 Pepys Inc debuted a mobile app called e-geaux (pr: ego) at the Capital Fringe Festival last month. Advertising for the show promised, “the only Cap Fringe show where you turn your phone ON!” and “Audiences will opt-in to the e-Geaux application with their real Facebook data!” Much confusion ensued: did the Festival sell out an empty Fringe slot to a tech company? Were there privacy concerns around how the app would use your data, in the show, and later? Was this even theatre? Since the show has run its course, and this post isn’t intended as a review, I’ll just walk you through the experience of attending e-geaux (or at least what I remember, it was a month ago) and not worry about all the spoiler alerts: walk into the theatre, and you’re asked to “opt-in” to sync your Facebook data with the e-geaux mobile website. The ask happens verbally, but also via an on screen QR code where the house curtain would have been. The psychology behind formally agreeing to participate in a production is interesting: both effort justification (I had to work a little harder than average for this show, so my perception of its value increases) and foot-in-the-door technique (I’ve said yes once already to an easy request, so I’m more likely to say yes to the more difficult task of audience participation) are at work. Audience members without smart phones were invited to sync their Facebook data via laptops in the lobby. House lights were left at somewhere around half-dim, which had the unintended benefit of making live tweeting not at all distracting. The AT&T lack of service however, that was a major bummer. Next up the data analysts did some fancy footwork to give us pretty pie charts of the gender, age, political affiliation & marital status of the audience, based on our collective Facebook data. And I began to wonder: what would/could we change about the theatrical experience if we (as the art-makers/marketers) if we knew this kind of data in advance of each night’s performance? Technically speaking, these graphs were pretty cool. The backend technology that Allen built meant the data analysts could simply drag & drop these automated Google Charts from a URL directly into a powerpoint. The remainder of the show revealed the five (aforementioned) features of E-Geaux. Each audience member got “personalized” recommendations, though the literal algorithm is effectively randomly. Achiever badges were handed out. A King (or Queen) of Klout was crowned (based on whomever in the audience was live tweeting with the #egeaux hashtag). And a few Facebook fanatics were outed (those with friend counts in the 4-digits). When the show concludes, E-Geaux purges your data from their system (privacy FTW! ), and directs you to post comments about the show to your Facebook wall (viral messaging FTW!). I seriously played with this for hours (maybe minutes). It still blows my mind. 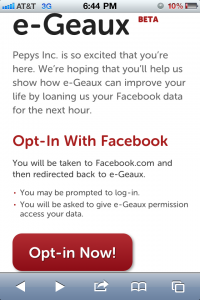 The future of Pepys Inc & E-geaux remains to be seen. The team is looking for limited run opportunities at other fringe shows, colleges, etc (interested? ), but first they want to expand the feature set of the app & live data viz opportunities, and then open source the script, technology, and slides. Open source theatre, you say?